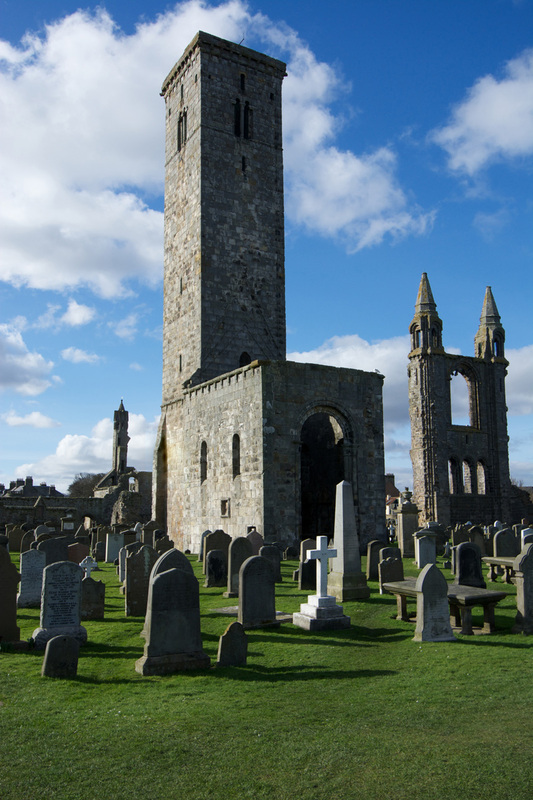 The long, narrow finger of St Rule’s Tower rises above the grounds of St Andrews Cathedral, reaching a height of over 100 feet and offering spectacular views of the coastline and the city below. Built in the 12th century, it would have been a welcome sight for pilgrims who had travelled from far and wide to worship the relics of St Andrew, which were housed within the church. St Andrew was one of Christ’s disciples. How on earth did his relics arrive at a small town in Fife? According to the Gospels, Andrew and his brother, Simon, who were fishermen from Galilee, were invited by Christ to become ‘fishers of men‘. Andrew was present at the Last Supper and in the garden at Gethsemane, and he saw the risen Christ after the Resurrection. In his mission to spread the message of Christianity, Andrew travelled widely through Greece and Asia; but his efforts were lost on the Romans. As a punishment for baptising the wife and brother of the Governor of Patras, they crucified him on a diagonal cross, a symbol which is used in the saltire or Scottish flag. During the 4th century St Andrew’s relics were preserved at Patras, in the care of a Greek monk called St Regulus (later known as St Rule). Legend says that St Rule had a dream in which an angel advised him to take some of the remains of St Andrew and hide them somewhere. St Rule obeyed. Soon afterwards, the Emperor Constantine had all the remaining relics moved to Constantinople. In a second dream, the angel advised St Rule to take the hidden relics ‘to the ends of the earth’ for protection. The angel decreed that wherever he was shipwrecked, he was to build a shrine for them. St Rule set sail, taking with him the precious objects which consisted of a kneecap, an upper arm bone, three fingers and a tooth. He headed west, towards the edge of the known world, and was shipwrecked on the coast of Fife. Maybe, with some divine premonition, he knew that the shrine that he built there would become the religious capital of Scotland, visited by thousands of medieval pilgrims every year. The University of St Andrews offers a slightly more prosaic version of this story. It suggests that the relics of St Andrew were brought here in 733 by Bishop Acca of Hexham, a well known collector of religious relics. The Bishop was a former abbot of St Andrews, and the religious centre had been founded either by St Rule or by Oengus, a Pictish king. Perhaps we will never know exactly who brought them, but one thing is for sure: the arrival of St Andrew’s bones and the establishment of a Scottish church served to strengthen the identity of Scotland, forming a powerful asset for medieval monarchs to wield over would-be invaders and even the Pope himself. 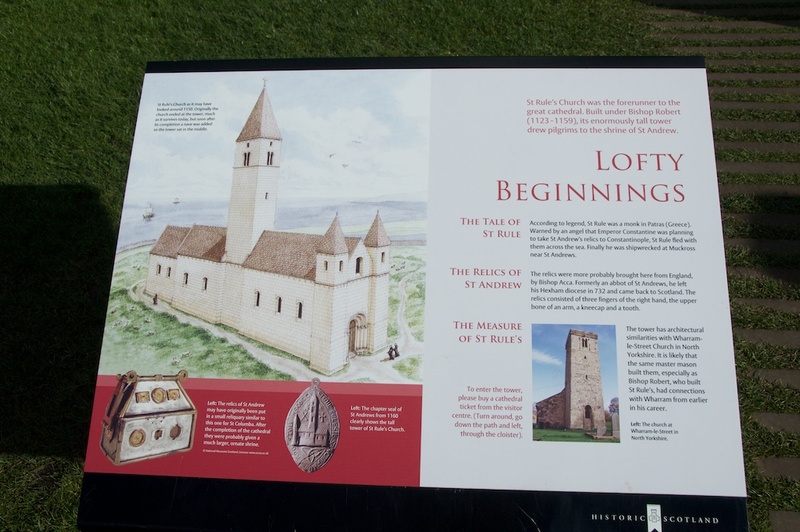 Pilgrims from all over Europe flocked to see the relics, and Queen Margaret – later Saint Margaret – endowed a ferry service across the Firth of Forth to make their journey easier. Hostels for accommodation were built on either bank, and these are still remembered in the names of North and South Queensferry. Little remains of the first and second churches that were built at St Andrews, which was then known as Kirrymont, in those early years of Christianity. They are believed to have been established on sites close to the harbour. Around 1127 a community of Culdee monks (in Irish, Céli Dé, companions of God) set about building St Rule’s Tower. As one recent surveyor has remarked, the stone has been beautifully dressed, and the tower is amazingly well preserved. In fact, there are similarities between this and the shorter tower of Muthill in Perthshire, which has similar origins. It is believed that the original church of St Rule comprised just the tower and a simple chancel. Inside was a shrine housing the precious relics, which were probably preserved in an ornate reliquary or casket. But after less than 20 years, in a move towards the Catholic Church of Rome, the monastery was granted to the Canons Regular who were following the Rule of St Augustine. The Culdees were ‘displaced’ (and quite possibly displeased!) and were forced to set up another house for themselves nearby. The Augustinian canons had bigger ambitions than the Culdees. They enlarged and extended the buildings attached to the tower, but after a while these proved inadequate for their needs. A new cathedral of magnificent proportions was soon rising from the ground next to the old church, and the extensions that had been added to St Rule’s were removed. By the time the cathedral was complete, the old tower had been restored to its original dimensions – which is lucky for us, because it now appears pretty much as it did was when it was first built (of course, the chancel would have been roofed). In the 17th century, a corbelled parapet was added to the top of the tower. In later years, some memorial stones have been inserted into the walls of the chancel, which look a little incongruous. If you are brave enough, you can climb the narrow spiral staircase and enjoy the views from the top. Be warned – it’s a tight, dark stairway, and if you are not keen on heights I’d advise you to give it a long, hard think before attempting! It is likely that they were lost during the Reformation, when many sacred artefacts and works of art were destroyed. On 14th June 1559, the cathedral and its shrine were desecrated by ardent followers of John Knox, who abhorred all the adornments of the Catholic faith. However, Scotland has since obtained some more relics: in 1969, Pope Paul VI gave some bones of St Andrew to Cardinal Gray, and these are kept in St Mary’s Cathedral, Edinburgh. 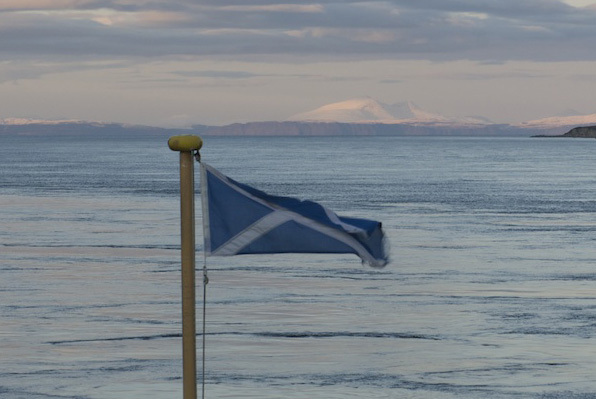 Scotland’s affection for St Andrew remains very deep-rooted. The website of St Mary’s Cathedral in Edinburgh explains: “It was commonly believed that the Apostle Andrew had chosen the Scottish people to care for and honour his relics.” His relics might have had a bit of a stressful time, but his spirit has been absorbed into the nation’s heart. St Rule’s Tower is in the care of Historic Scotland; it’s open all year, admission £4.50 for adults. More information on the Historic Scotland website. If you enjoyed this, you’ll love St Andrews Cathedral, described as Scotland’s largest and most magnificent medieval church. Or, if you’re brave enough to take a walk on the dark side, check out the Ghosts of St Andrews! I know, Ed, it’s impressive! I have seen pics of Clonmacnoise but I don’t know how high it is. When you consider how old St Rule’s Tower is, it’s in amazing condition! Definitely, I have only seen images of Clonmacnoise, but hope to get over there this year. St. Rule’s tower looks magnificent. I look forward to reading about it, and seeing your pics! Fascinating stuff Jo – bellringers are always enthralled by tall towers – bells or no! The tower actually reminded me a little of the towers in some Italian cities, which always seem to be just too tall – you can’t help wondering why they wanted them so high. Looking at these photos and reading the story, this place seems very special. It’s now on my wish list to visit! It certainly is, Susan – I knew it would be good, but I was just bowled over by the place! I didn’t realise just how much history was attached to it. 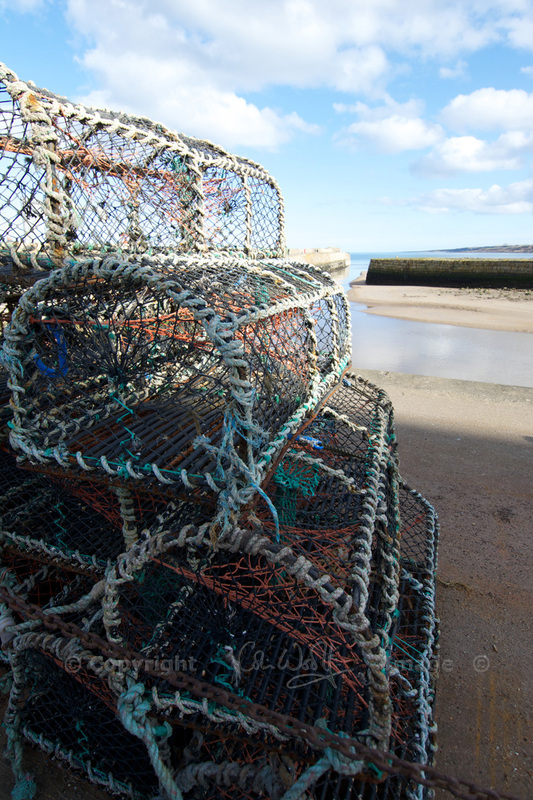 You would love the city of St Andrews, too – so picturesque, with lovely traditional shops. I visited St Andrews a few years ago and loved wandering around the monastery and old gravestones. I think ruins are beautiful in general but the seascape right beside these added something special. I kind of wished I had your notes at the time though! Will have to go through my old photos and reminisce. Thanks for another great piece! You’re right, being by the sea adds another dimension, and the flat horizon emphasises the scale of the buildings. Isn’t it an amazing place?! I want to go back! Thank you – really glad you enjoyed it! Such an amazing place, and beautiful photography to show it off! I would love to go see it! I know… I really want to go again, now! There’s much more to see, including the Castle, but it had scaffolding so I decided to leave it for another time. I don’t really know how I pictured St.Andrews but this post has wet my appetite to find out more. I’m glad about that, because you’d love it! Such an attractive city, in a lovely setting. I like St Rule’s dream version of events although Bishop Axxa sounds like an intriguing fellow. It’s strange, this obsession with the bones of saints, but there’s no doubt that it makes for an interesting bit of history when you get tales like these. I didn’t know anything about how St Andrew’s remains might have got here, so I’ve learned a lot from this post, thank you. I know – even the tiniest fragments of bones had a very important role to play! I prefer St Rule’s story, too, especially when you think of the courage needed to embark on such a voyage. I may have been tempted to just bury them! 🙂 I’m glad you enjoyed this – I really enjoyed finding out about this history myself, because I knew little or nothing about St Andrews before going there. St Rule’s Tower St Andrews. St Rule (or Regulus) is said to have brought the relics of St andrew to Scotland. I thought St. Rule’s church/tower was built in the 11th century and the cathedral in the 12th century. Do you have a date for St. Rule’s? Thanks so much, Jo. Yes, I believe there was an earlier church there and the St. Andrew’s bishop in 1072 when my current work in progress is set was Fothad II. Alas, I can find nothing on the church’s construction. Thanks. Nice to learn that I am not the only Saint in the Rule family! Had the great pleasure of visiting St. Andrews to celebrate my great god-niece’s 21st birthday in June at the Earl of Dundee’s castle nearby. She is now a senior at St. Andrews and I hope will receive good guidance from St. Rule about her future plans. If there is any more reliable information about St. Rule, would like to have it. Our family came from the shores Rule Water on the Borders, near Jedburgh. In ancient celtic it means “roaring in haste”!